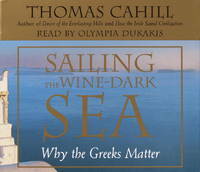 THOMAS CAHILL is the author of the three previous volumes in the Hinges of History series: How the Irish Saved Civilization , The Gifts of the Jews , and Desire of the Everlasting Hills . They have been bestsellers, not only in the United States but also in countries ranging from Italy to Brazil. Cahill was recently invited to address the U.S. Congress on the Judeo-Christian roots of moral responsibility in American politics. He and his wife, Susan, also a writer, divide their time between New York and Rome. 2003-06-08. Good. Ships with Tracking Number! INTERNATIONAL WORLDWIDE Shipping available. May not contain Access Codes or Supplements. May be ex-library. Shipping & Handling by region. Buy with confidence, excellent customer service!